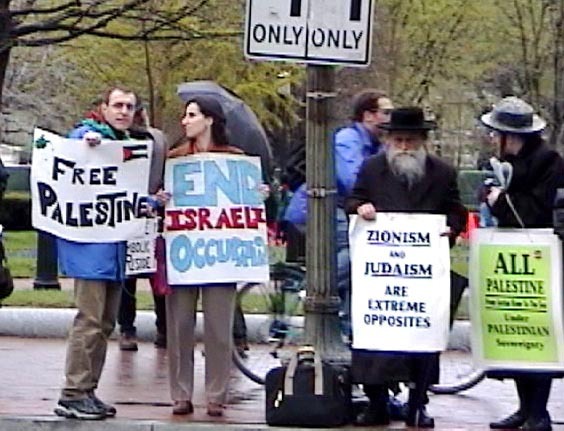 "Thou Shalt Not Criticize the Zionists!" There is an 11th Commandment! It states: �Thou Shalt Not Criticize the Zionists.� Recently, the Brit�s Royal Court Theater wanted to put on a play, in NYC, entitled, �My Name is Rachel Corrie.� Corrie was the peace activist, who was killed by an Israeli bulldozer, on March 16, 2003, in Occupied Gaza. The NYC theater company, however, has �postponed� the production because Jewish leaders objected to it. This is an example of that 11th Commandment! The 11th Commandment came up the other day, and in spades, too. The New York Theater Workshop was planning on putting on a play honoring the memory of Rachel Corrie, but then it got cold feet. It's a British production, entitled, �My Name is Rachel Corrie.� For background: Corrie was the 23-year-old peace and justice activist, who was killed by the Israelis on March 16, 2003, in Rafah, a refugee camp, located in Israeli Occupied Palestine. (3) The killing device of choice was a monster of a bulldozer. Corrie, from Olympia, Washington, was protesting the Israelis� barbaric practice of destroying the homes of Palestinians for little or no reason at all. The Israelis didn�t run her over once with their huge bulldozer, but twice! The second time, I suppose, was to demonstrate the contempt that they had for her country, too - America! The Israelis killed her on purpose! And, do you know what? They got away with it! The failure of the U.S. government to respond to the brutal slaying of Corrie is a stain on the Republic. Back to the play! The artistic director of New York Theater Workshop, James C. Nicola, decided to �postpone� the Corrie drama after he polled leaders of NYC�s Jewish community. He supposedly discovered that many of these ultra-sensitive souls were �uneasy� about it being performed at the present moment. (4) Oh, the poor things! Running an American girl over with a nine-ton Israeli bulldozer, snuffing the young life out of her is no problem, but please, don�t do a play about that evil deed. It will make the NYC Zionist crowd feel �uneasy.� Pure baloney! I think this is a classic example of the 11th Commandment at work. Finally, the play, "My Name is Rachel Corrie," is sure to be critical of the Zionists. Trust me, they fully deserve it. If you don't believe me, then just ask the veterans of the USS Liberty, who have been fighting for nearly four decades for justice for their cause. (11) Of course, the Zionists have every right to push their agenda in this country, but those who disagree with them have a right, too, to say: "You've crossed the line on this one, buddy!" (12) It's time to ditch that sacred cow of an 11th Commandment. Our shaky Republic can no longer afford it. 4. �Tensions Increase over Delay of a Play,� by Jesse McKinley, NYT, 03/07/06. 9. "U.S. Replacement Doubtful for Dubai Operator at Port," Baltimore Sun, 03/06/03, by Meredith Cohn. William Hughes is the author of �Saying ��No� to the War Party� (IUniverse, Inc.). He can be reached at liamhughes@comcast.net.